PRELUDE: I was invited to give a lecture and a course at the Annual Meeting of the Society of European Ophthalmology (SOE) in Vienna, Austria. The meeting was joined by the American Academy of Ophthalmology (AAO,) which is why I agreed to attend. We planned to drive to Vienna and then drive back to explore Munich before touring the rest of Germany. The concierge at the Munich Sofitel warned me that all the hotels would cost double when we returned because there was a huge trade show in town at that time. Therefore I decided to head north from Vienna after the meeting and tour East Germany first. Sorry for the length, but all four days in Vienna will be covered in this Diario since it is only a side trip. I woke up at 5 AM and then again at 7 and 12:15. I finally got up at 1:30 PM. My aversion to running up and down hills lead me to do my run on the treadmill in the hotel's very classy spa and then I finished up on a trail I found behind the hotel. The air was exhilarating and the views of these mountains really made you feel alive. Running up and down some hilly areas also added to that feeling. I wound my way back to the hotel and to the Spa and enjoyed a nice cappuccino and relaxed. At 2PM we packed up, checked out of the hotel and by 3 we were on the Autostrada heading east into Austria. Marcia drove the first 71 miles to Vienna. Marcia needed her mandatory lunch, so at 4:20, she pulled off the highway at this AutoGrill which was like no other we had ever seen (below.) Marcia ordered a bowl of goulash and I had a cappuccino to gird me for the remaining drive. I helped her finish the goulash and it was really very good. I bought a map, a Bounty bar and 3 diet-cokes. We were done by 5 PM and I volunteered to drive the remaining 131 miles to Vienna. Her back was still bothering her and I thought maybe her driving wasn't helping. 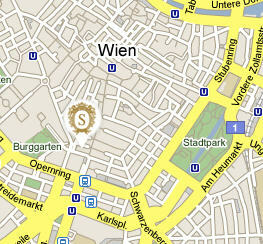 We arrived in Vienna at 7 PM and checked into the Sofitel Vienna (Rm #512) [35 Am Heumarkt, +43-(0)1-716-160.] 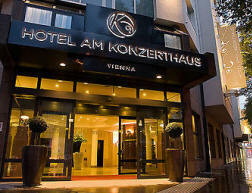 It is now called the Hotel Am Konzerthaus. It was very nice, but not one of the best we have been in. 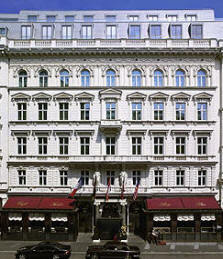 Maybe that is why it is now a Mercure Gallery hotel and not a Sofitel. We unpacked and then at 8:45 went down for our "welcome" glass of champagne which is free because of our Accor Favorite Guest Card. By 9 PM we were in a cab on our way to Stephan Platz (€6) to find a place to eat. At 9:30, we were in a place called Segafredo and I had my first Zipfer Pils (beer) on this trip. It's my favorite beer and I can only get it when in Austria. Marcia had wine. We had heard that Vienna is famous for these little cubbyhole basement wine bars. We wandered around and at 10 PM we climbed down the steps into the Villon Weinkeller [Habsburgergasse 4, +43-(0)1-967-9129] and each enjoyed a glass of lovely white Austrian wine. 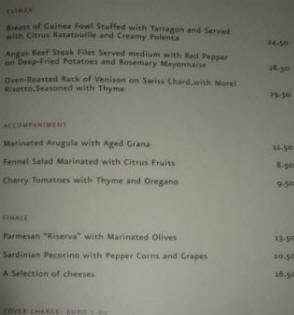 ...and looked over their menu which was quite extensive. We started out with a bottle of Cortona Sauvignon blanc wine and I had Venetian Crab with fried zucchini blossoms (below left,) followed by a rack of veal stuffed with Mascarpone on grilled zucchini (below right.) They were both incredible, even if I would have loved a few more of those zucchini blossoms. Marcia had their pea soup and then filet of Turbot (fish) with homemade lime ravioli, baby spinach and artichokes, which she said was very good. This whole dinner we both described as very very good. A definite place to return to. After dinner we walked around a little and decided to go back to the Villon Weinkeller. We got there at 11:45 and had several glasses of their excellent wine while striking up a conversation with our new-found friends Rudy and Virgilio. A great way to meet new people. They gave us some very good advice as to where to eat, especially to find a good Hungarian restaurant. This is the series of masks the wine Keller had hanging on the wall. We finally bid Rudy (left) and Virgilio (right) "guten nacht." We caught a cab back to the Sofitel hotel and went to bed at 3 AM. The Society of European Ophthalmology was being held in the Vienna Convention Center and since I didn't wake up until noon, I missed today's 10:30 AM Opening Ceremony which included the Austria Boys Choir. I dressed in jacket and tie and finished up on both SONY VAIO computers getting my talks prepared. I brought the extra one as a backup after the 2005 experience with the broken screen. I followed the concierge's advice to skip the expensive taxi and walk to the Karlsplatz U-Bahn station (left and above right: 2 lower buildings) a couple of blocks away. It was pretty fancy and ornate. To the right is a map of the city of Vienna. By 2:40 I was on the U-bahn train to the Austria Center. It was modern, clean and very fast. I didn't know where or how to pay for it and at 3 PM, I arrived almost in front of the complex. 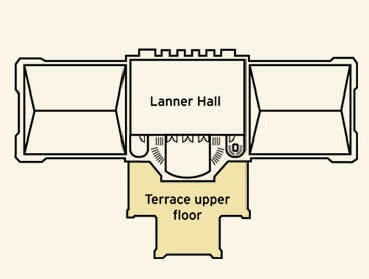 Above left is a city map of Vienna. At 3:15 I went to he Speaker Ready Room and finalized my slides and handed them in for my lecture. I also got free internet access to do AOL email. Then I went and found the room I would be speaking in and by 5:30 I was taking the U-Bahn to Stephanplatz. I arrived from underground (above right) right in front of their main cathedral, St. Stephan (of Hungary.) At 6 PM I attended Mass since it would be impossible to find time tomorrow. The cathedral is very beautiful (below center) with the same roof style as the one in Budapest. The interior and altar (below right) are fitting a major cathedral. 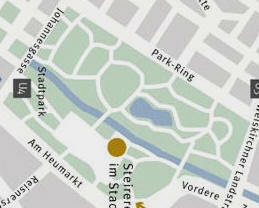 After Mass, I took the U-Bahn back to the Sofitel, changed and at 8:45 did my run to Stadpark and back. At 9:15 I arrived and had a cappuccino at the Sofitel. It was getting late and we were told the hotel restaurant was very good (don't they always say that?) 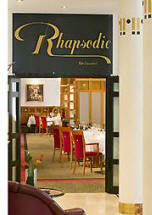 At 10 PM we sat down to eat at Rhapsodie (left and below.) We were the only ones in the place. We shared a bottle of Römerquelle (Austrian sparkling water) and we each had a salad (salat) with cucumbers. For my entree, I had Hungarian goulash and Marcia had Kalb Wienerschnitzle (veal) with boiled potatoes. We each had Hungarian palacsinta (crepe) filled with apricot jelly. It was all surprisingly good and we are glad we came here. We got to bed at 1:30 AM. I have a big day tomorrow; I have to perform. I woke at 4:20, 6 and 9, finally getting up at the ungodly hour of 9:30. I dressed and at 10:15 I again walked to Karlsplatz to catch the U-Bahn at 10:25. I arrived at the Austria Center which had this huge yellow artistic presentation over the entrance. The "Rapid Fire Session" I will be speaking in starts in Room H at 10:30, so I will be a few minutes late. My talk is scheduled for 11:50 and is titled "The Hoffer/Savini Tool for Calculating IOL Power in LASIK eyes." I am limited to 6 minutes with 2 minutes afterwards for discussion. It went just fine and I stayed on schedule. I also had a E-Poster for presentation entitled "FDA Testing of TechnoMed Exact-Power Labeled IOLs." After my talk at 12 noon, I met Vincenzo Russo, MD from Foggia, Italy and Karolina from Brno, Slovakia as well as Claus Dreher from Zeiss. I then went to one of the exhibits to have an espresso with Vincenzo and wound up meeting up with Matteo Piovella MD, my friend from Monza, Italy, Howard Fine MD from Eugene, OR and Jack Holladay MD from Houston. This was a chance to chat and relax before my 90 minute monologue called the "Hoffer IOL Power Course" to be given in Room M at 2:30. The course went very well with a large audience and a standing ovation. Feeling in good spirits from that surprising response, at 4:00, I went for a cappuccino with Vincenzo (below left,) Lily Speicher MD from Innsbruck, Austria (below right) and also worked on a Hoffer Programs error problem with Karolina. At 5:30 I caught the U-Bahn back to the Sofitel with Vincenzo, who I had just met at this meeting for the first time. I got to the hotel and changed and at 7:15 went for my run to Stadpark again but this time in the rain. Not too much fun. As you can see from the map, the park (green) is not far from the hotel (pointer) and there is a "river" running through it (below right) similar to the Los Angeles river. The Stadpark U-Bahn station (below left) is where I entered it. There are many statues and stately buildings along the waterway called the Wienfluß (above right), making the run rather interesting. 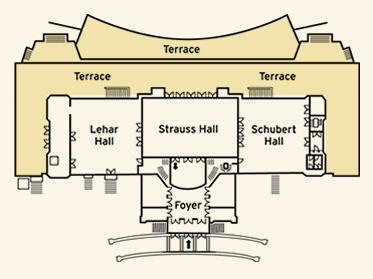 The Meierei (below left) was the former milk drinking hall erected according to plans of Friedrich Ohmann and Josef Hackhofer during the years of 1901-3. After suffering heavy damage during World War II, the building was extended during reconstruction. 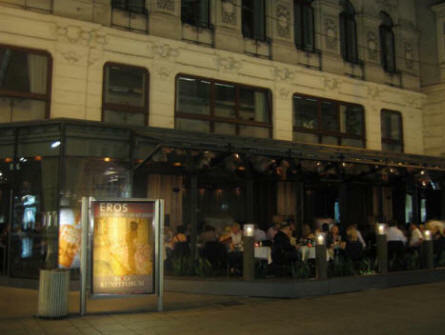 Today, with another annex having been built, there is a restaurant in it. It was built in 1867 after Emperor Franz Joseph tore down the city walls. As can be seen it is a beautiful place to hold major social events. I ran around the back side of the building through this large garden. Here is the back side of the this beautiful building and the "Unsere Gärten" ("Our Garden") sign with clock. As I finished my run with my umbrella, I noticed this interesting display of garden art easels on the lawn which was quite unusual. Another proof that these runs cause me to see much more than I would have planned. I got back to the hotel, dried off and changed for dinner. 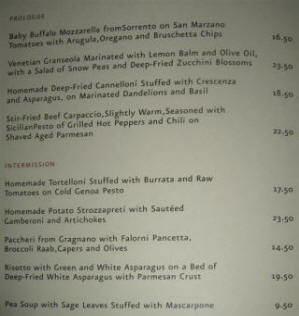 At 8 PM Marcia and I caught a taxi with Vincenzo for dinner downtown. Italians as a rule prefer Italian food and do not like to experiment; Vincenzo was no exception. He is from Foggia in the west side of southern Italy. 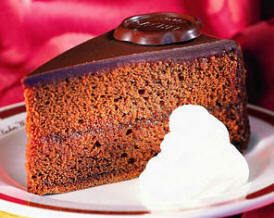 But I wanted him to try the cuisine of my heritage; Hungarian. So at 8:15 we sat down for dinner at Ilona Stuberl, [2 Bräunerstraße, +43-(0)1-533-9029] the place Rudy and Virgilio had recommended. Thanks guys; it was good. Vincenzo and I had Zipfer beers and then we ordered a true Hungarian white wine: Badacsonyi Szürkebarat which was very good. Marcia had a salat and then a large order of stuffed cabbage. The men each had a small order of Hungarian goulash with tarhonya, a Hungarian type of pasta (below left.) Then we followed that with small orders of stuffed cabbage (below right) with sauerkraut and then an entree of chicken paprikash. Can you believe these are the small orders. For dessert we all tried the palacsinta with jam, cheese and chocolate (right.) 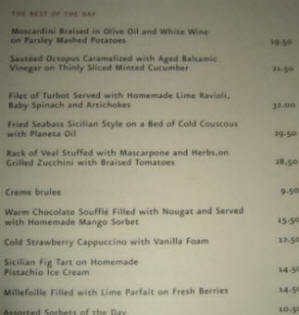 It was all very good and Vincenzo said he now has discovered Hungarian food, which he had never eaten before in his life. We have to thank Maria Fodor (left) for continuing the tradition of excellent Hungarian food in Vienna. At 11:25 we were finished and caught a taxi back to the Sofitel. Then at 11:45 we stopped in the hotel's Pullman Bar for a glass of champaign. It was covered with panels and objects from old Pullman train cars. We called our son Jeff in the US and talked to our granddaughter Kaylin. Near midnight I got the long awaited call from Dima telling me that he was back home and that he had shipped my vitamins and extras to his friend Leo in Berlin where I could pick it up when I get there. 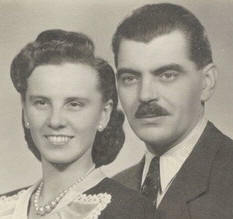 He brought them to Italy from the US on his last visit. After a very full and eventful day, I got to bed at 1:30 AM. Again I awoke at 4:30, 6:45 and finally at 3:30. The jet lag is still hitting me. I got up at 4 and at 4:30 I walked to K ärnterstraße Apotek NG and bought T-Mobile cards for our phones. By 5:30 I stopped and had a cappuccino at a caffe and bought some more phone cards. 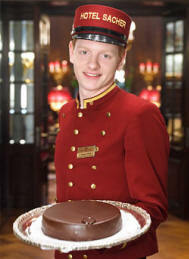 At 6:30 I walked my way to Hotel Sacher (see later) and bought one of their famous Sacher-Tortes to take back to Marcia. 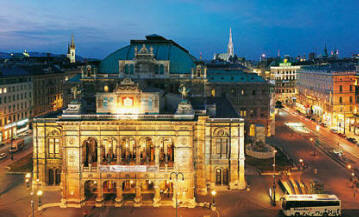 The buildings and architecture are just beautiful in Vienna. Following are some scenes of Vienna. The street musicians were interesting and having had 10 dental implants, I found this stack of yellow pages with Zahnimplantate prominently advertised on the sides worth capturing. In German, Zahn means Tooth and Zahnarzte mean Dentists. Walking back I had to photo the most famous memorial in Vienna, the "gold" one of Johann Strauss II (1825-1899) playing his violin. 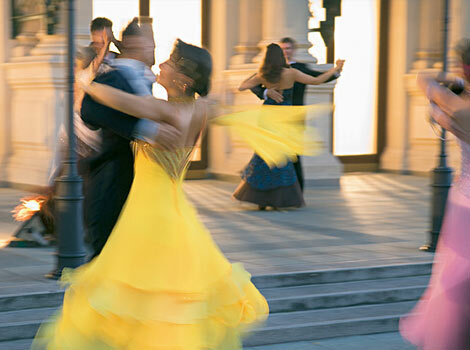 He was known in his lifetime as "The Waltz King", and was largely responsible for the popularity of the waltz in Vienna during the 19th century. He revolutionized it, elevating it from a lowly peasant dance to entertainment fit for the royal Habsburg court. Photo (right) is Strauss (L) and Brahms. 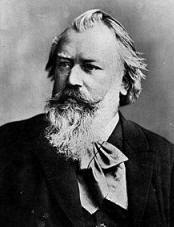 Below is the Johannes Brahms (1833-1897) statue. 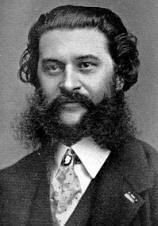 He was a great German composer who spent many years of his life in Vienna, the centre of musical life in his time. I also came across the Moulin Rouge of Vienna. I got back to the hotel at 7:45, changed and did my run at 8 PM to Stadpark once more. It is much nicer when it isn't raining. 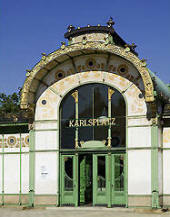 The park is 16 acres (65K m2) was first opened on August 21, 1862, becoming the first public park in Vienna. The park is very large and at one of the corners is this Hübner's Biergart'l #1. It was so inviting I was tempted to have a bier but decided not to. The sign is famous as an example of the incorrect use of an apostrophe in the German language. I got back and changed and at 8:30 we caught a taxi to downtown. We walked around the main areas. 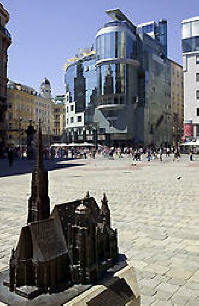 The central piece appears similar to the one in Marienplatz in Munich. 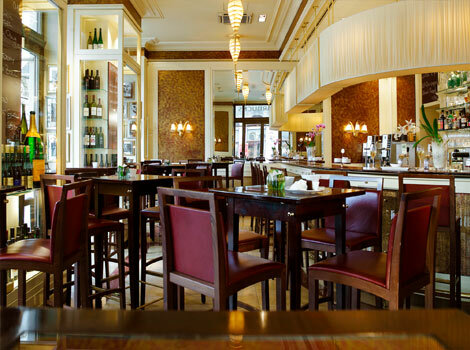 We were heading for dinner at the fabulously plush Le Ciel Restaurant in the Grand Hotel Wien [Kärntner Ring 9, +43-(0)1-515-80-9100.] This used to be the ANA Hotel when we ate at Le Ciel on June 6, 1997 and brought Dima here on September 6, 1999. We were happy to see it was still here. The outside patio (below left) was completely full, so we sat alone in the inner dining room where we have in the past. That's two nights in a row having the room to ourselves and thus we had the piano player all to ourselves. We started with a Renner Sauvignon blanc and Vöslauer wasser. What a meal; it wasw just fantastic. I was full but our deserts were free with the standard €8 couvert (cover charge.) 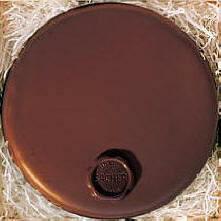 We had crepes flambéed and then they brought us a Ferris wheel of sweets accompanied by after-dinner liqueurs. I just noticed today (3/1/09) on their website that the couvert has dropped to €5. The €8 cost $10.68 in 2007 and the €5 costs $6.32 now; a difference of $4.36 or a 41% drop! Ain't this economy great? A good time to go to Europe. 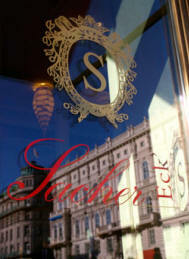 At 11:30 we went to their very neat bar called the Sacher Eck (below left.) 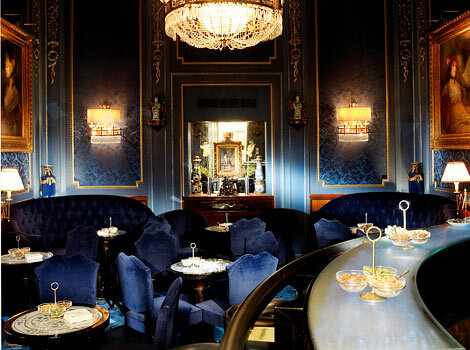 They have a fancier bar called the Sacher Blaue Bar (below right.) I had a Zipfer beer and Marcia a glass of wine as we relaxed on their veranda watching the crowds pass by. At 11:45 we took a taxi back to the Sofitel and by 11:50 I was on AOL doing email and then reviewed a paper for the Cataract Journal (JCRS), wrote a letter to the members of the Monterey County Medical Society regarding the issue of leaving CMA. I finally finished and went to bed at 5 AM. Tomorrow we head for our tour of the vast country of Germany.